Homeowners know that one of the best places to entertain friends and family is right in your backyard. 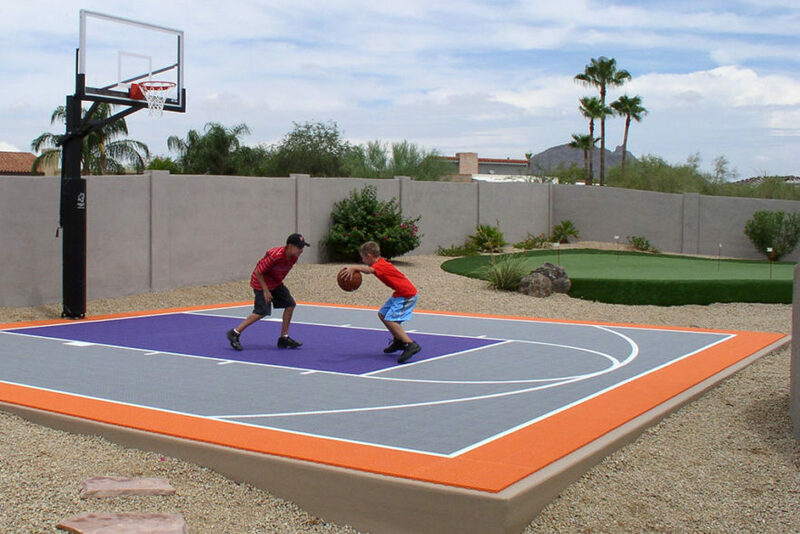 Now, you can host a different kind of fun with a backyard court system from Rhino Sports powered by SYNLawn. From basketball, volleyball, tennis and more, your dream of playing any game you can imagine conveniently at home can come true! While the summer season is the perfect time to install the popular half-court basketball court or multi-purpose court, you can enjoy whatever configuration you choose year-round. It’s a slam-dunk decision, especially with a 12-year limited warranty, because the investment in your family will be sure to last for generations. If you’re still on the fence, here are six of our favorite reasons why you should add an outdoor court surface to your backyard. Now that school’s out, you might be thinking of different ways to keep your kids busy, and sometimes that’s not an easy task. Whether your children are glued to the cartoons, your teens can’t put down the video games or your college kids spend way too much time binge watching their favorite shows, you’ll be able to get them staying active and enjoying the outdoors when you install a sports surfacing system in your backyard. Not only is it great exercise for them, but it also will give the entire family the chance to build both athletic skills and healthier bodies. Unlike a concrete or asphalt court, these backyard courts from Rhino Sports powered by SYNLawn are made up of a suspended shock-absorbing surface, which helps soften falls. This is particularly important for those with little ones who want to create a backyard for safe play. The high-impact polymer tiles help reduce impact shock to your joints and muscles too. You can play ball as much as you want without the wear and tear on your body! We have kids now that have grown up on their courts and received college scholarships because they started out playing for fun, developed an interest and got really good. When it comes to your new backyard court, bigger is definitely better, especially if you have the space. And if you have little ones, it’s best to plan for the long term. “Often parents think that kids will outgrow the court, which in reality is exactly the opposite,” said John Shaffer, owner of Rhino Sports. “We have kids now that have grown up on their courts and received college scholarships because they started out playing for fun, developed an interest and got really good,” he added. You can make the most of your backyard experience with a sports surfacing system from Rhino Sports powered by SYNLawn. Your sports landscape design professional will help you select the right size court for your backyard and your budget. To learn more about our backyard courts, contact your local SYNLawn distributor for a free design consultation!